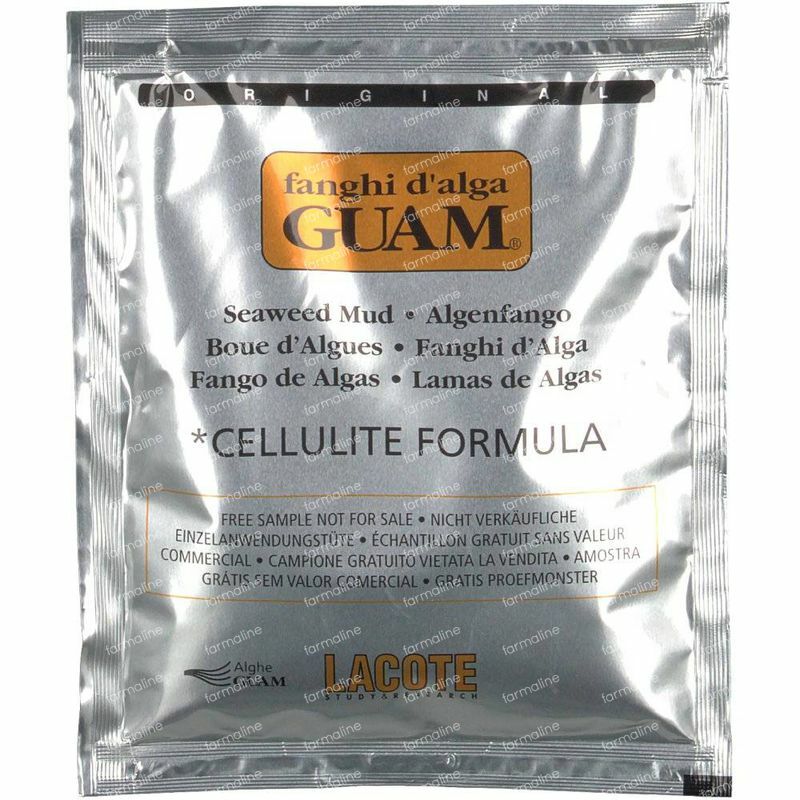 Guam Fanghi d'Alga Seaweed Mud FREE Offer 75 ml order online. 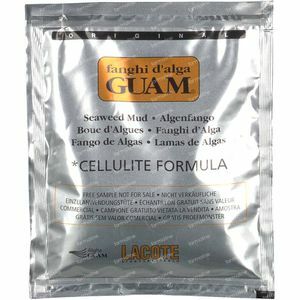 Guam Fanghi d'Alga Seaweed Mud is an effective aid in defeating cellulite. Due to the natural properties of the seaweed, cellulite is visibly reduced after the first few applications. This formula also stimulates, tones and firms the skin giving it incomparable, long lasting softness and elasticity. To obtain th ebest results from this natural preparation, it is important to mix it well to achieve a soft, smooth, creamy texture. Originating in Italy, this seaweed and clay mix has active properties that apparently break down cellulite. Due to its natural properties, they provide immediate visible results just after the first few applications. 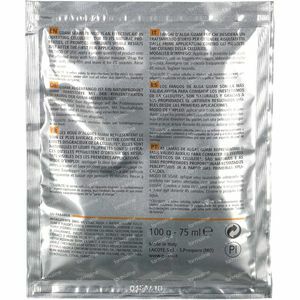 Active Ingredients: Algae extract (Dry seaweed), Ivy extract, Horse Chestnut, Lemon oil. Using nature's very own produce, the Guam Seaweed Mud is impressive when attacking specific localised cellulite. Method of use: Massage a generous amount of GUAM Seaweed Mud in the affected areas, making sure the skin is completely covered. Using household clear film 2/3 up the thigh, and then like a skirt around the top of the thighs and bottom. After 45 minutes, rinse the mud and clear film off together in the shower. Finish by massaging with GUAM Strengthening Gel until completely absorbed. For maximum benefits we recommended a daily application for the first 3 days, the once every 2 days and so on, to achieve a once a week application. Maintenance: once per month or as required. AQUA/WATER, SOLUM FULLONUM/FULLER'S EARTH, ALGEA EXTARCT, SODIUM CHLORIDE, GLYCERIN, PARFUM/FRAGRANCE, FUCUS VESICULOSUS EXTRACT, HEDERA HELIX EXTRACT/HEDERA HELIX (IVY) LEAF STEM EXTRACT, AESCULUS HIPPOCASTANUM BARK EXTRACT/AESCULUS HIPPOCASTANUM (HORSE CHESTNUT) BARK EXTRACT, CITRUS MEDICA LIMUNUM OIL/CITRUS MEDICA LIMONUM (LEMON) PEEL OIL, ORIGANUM VULGARE EXTRACT/ORIGANUM VULGARE FLOWER EXTRACT, CITRAL, LIMONENE, LINALOOL. Take care not to use the product on skin allergic to the ingredients or on irritated/damaged skin. It produces a tingling sensation and a reddening effect on the skin; this is quite normal, if it is too intense, rinse with cold water. 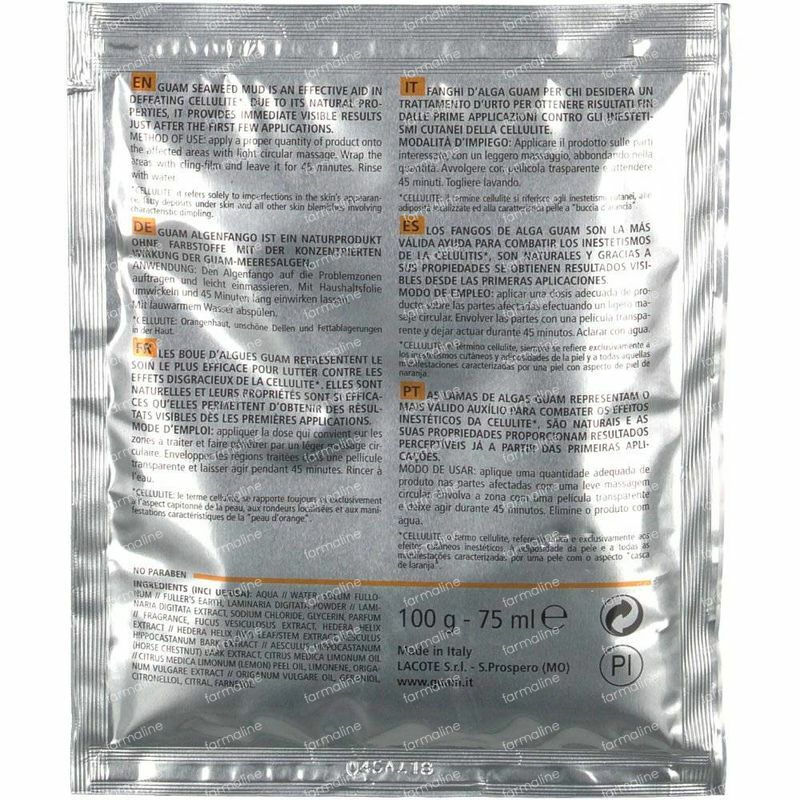 People with extremely delicate skin which is prone to redness and/or thread veins are not advised to use this product; if in doubt, test the product prior to application. Avoid contact with eyes, mucous membranes and particularly delicate areas of the body. Avoid exposure to direct sunlight after application. Do not use during pregnancy.